Scooper - Technology News: How can we give cocoa farmers a sweeter deal? How can we give cocoa farmers a sweeter deal? With demand for chocolate projected to go through the roof, as countries like India and China start to get an appetite for the world’s favourite sweet treat, you'd think it would be cause for cocoa farmers to celebrate. But the reason demand is set to outstrip supply is not just about new markets: it is largely down to decades of insufficient investment in cocoa farming, particularly in West Africa, where the bulk of cocoa comes from. Today, across West Africa, farmers are getting old, as are their trees, and the next generation sees little reason to stay on the family farm. The huge players who dominate the chocolate market have been shaken by these forecasts into investing millions to secure their supply chains. But not a single company is offering is to pay cocoa farmers more. Typically, a cocoa farmer in Ghana, the second-biggest cocoa producer after Côte D’Ivoire, will earn around the equivalent of $520 a year, even less if they're a woman. This must feed, house and educate their families, and pay for everything they need to keep their farms productive. And it's not enough. It's no wonder, then, that when you ask young people in these communities what they want to do, you’re likely to be told hairdresser, doctor, seamstress or bank assistant – anything but staying on the farm and living hand to mouth. The gulf between this world and the world where an average 100g bar of chocolate costs around $2.50 – and where I'm based, in the UK, we eat an average of 11kg of chocolate a year – couldn’t be wider. In 2012, it was estimated that the value of the world chocolate market was worth around 10 times the value of the world cocoa market. By 2019, this ratio is projected to go up by a factor of six, which tells you a lot about what some milk, sugar and great brand marketing can do. Achieving the highest possible profits is fundamental to most business models, which is why input prices are driven as low as possible. In the chocolate supply chain, chocolate producers have paid cocoa farmers as little as possible and have kept them in the dark about how much their product makes at the other end of the supply chain. When I first went to Ghana back in 1999, many of the farmers I spoke to had never tasted chocolate, and had no idea what their cocoa was being used for, let alone what people in other countries spent on it. We need to accept that the future sustainability of all our food supplies, 80% of which we depend on smallholder farmers, needs to factor in sustaining people, their land, and communities – not just higher productivity and efficiency at whatever cost. Paying farmers sustainably means paying enough for them not only to support their families but to invest in the future of their farms. Giving farmers the means to care for their land, and make a viable business from their farming, means thinking for the long term – not just about making sure we have chocolate for decades to come, but also about keeping the land fertile and the rural communities that live on it thriving for generations to come. That's what we've done with Divine Chocolate. With our 44% farmer ownership model and shareholders who are genuinely committed to our mission to improve lives for cocoa farmers, we're turning that accepted model on its head. Our business model, which gives cocoa farmers the biggest share of the company, serves to demonstrate what is possible if sustainable trade with cocoa farmers is your goal. If we can do it – creating a real global partnership with farmers, empowering women, and giving farmers the incentive to create and maintain thriving rural communities – then so can global businesses. 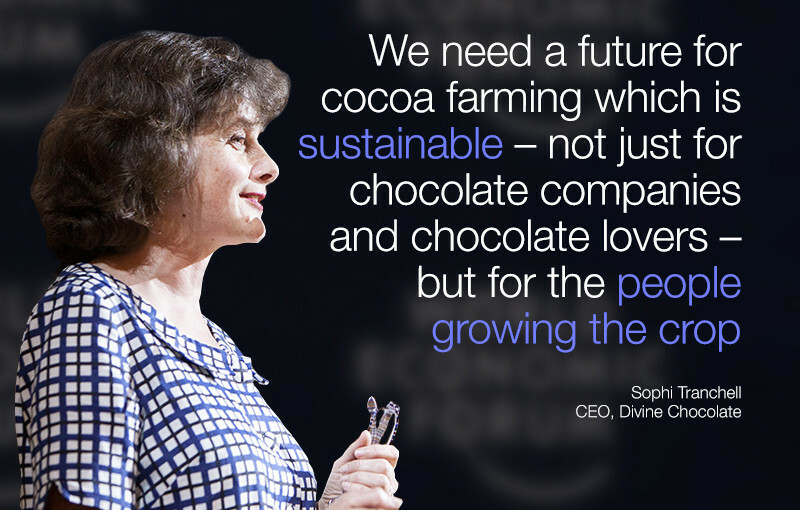 We need a future for cocoa farming which is sustainable – not just for chocolate companies and chocolate lovers – but for the people growing the crop.